Create your own cloud, migrate to your own email system, maybe even build your own social network: a lot of us have been thinking about doing it for a while, but we've lacked the incentive to make the effort for relatively little gain. Well, we now have all the incentive we need, as it becomes clearer every day that our 'private' information is a commodity for sale like everything else. Follow our guide to online freedom and you'll never be sold to advertisers (or the NSA, or GCHQ) ever again. On a lighter note, we hear from Raspberry Pi founder Eben Upton about his plans for the future, learn about the sterling work of electronic freedom fighters the EFF and take a peek into the murky world of KDE development. There's also brain fodder in the shape of Lisp, MariaDB , Ruby On Rails, Cuda, Raspberry Pi and LibreOffice tutorials, along with the healthy dose of insight, love and passion that characterises Linux Format. On the DVD:Debian 7, Mageia 3 and Sabayon. 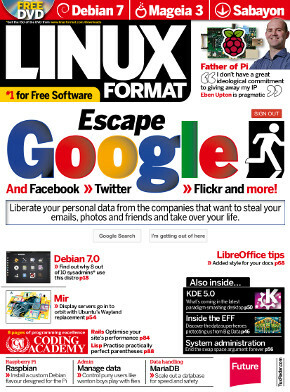 Plus: Tutorial code, answers, a complete copy of Linux Format issue 64, and more.